What was originally created as a way to sell snowboards on the Internet is quickly becoming the go-to e-commerce solution for small merchants worldwide. As Ottawa-based Shopify Inc. passes the 100,000 merchant mark, the software-as-a-service platform that Tobias Lütke first created because he wasn’t satisfied with available online tools for his snowboard sales business has grown well beyond snowboards and well beyond Canada’s borders. Expecting to transact in excess of $3 billion of client sales this year, Shopify continues to grow at an exponential pace. Its goal is to double the number of merchants it works with worldwide by 2015. Its scope is already big enough to catch international attention. For instance, Shopify works with 5,000 merchants in India and plans to double that by next year. It also has a growing base in Europe as it connects preferred local payments solutions to its platform and forges new partnerships. The growth is attracting interest from other e-commerce developers looking to pedal their custom solutions on a big platform. Perhaps the only thing in the cloud ecommerce world that’s growing faster than Shopify itself right now is Shopify’s app store, according to Blair Beckwith, app store lead with Shopify. While Shopify has grown 400 per cent in the past two years, its app store has grown at a rate of 1600 per cent. Shopify’s platform is appealing because of its “gangbusters” growth, says Sandy Hathaway, CMO at RetentionGrid. Shopify showcased a couple of its premium app store partners at a June event in its Toronto office, gathering local online merchants to see presentations from Berlin-based RetentionGrid and Netherlands-based Robin. It was Shopify’s simple design and user interface that first appealed to RetentionGrid, says Sandy Hathaway, a co-founder and CMO at the German firm. “We knew they were growing like gangbusters and they have money to put behind that growth,” she says. Helping support 4.5 million consumers doing business in 55 different countries, RetentionGrid has been available on Shopify’s platform for more than a year and serves 2,200 Shopify merchants. Shopify was the firm’s first platform for integration, offering its unique approach to monitoring customers based on their loyalty and triggering automated marketing messages based on customer behaviour. Facilitating developer success is a point of pride at Shopify, Beckwith says. “We’re in a great spot where we’re big enough that we have the resources to help our partners, but small enough that we can spend the time with them,” he says. Shopify supports its app partners so its merchants can access the tools they need to be successful, Beckwith says. After all, running an online business is about more than just using Shopify’s inventory management and website tools. Shopify customers can turn to some of the most-downloaded apps like MailChimp to run an e-mail marketing campaign, or Yahoo’s package of advertising, marketing, and analytics tools to boost sales. 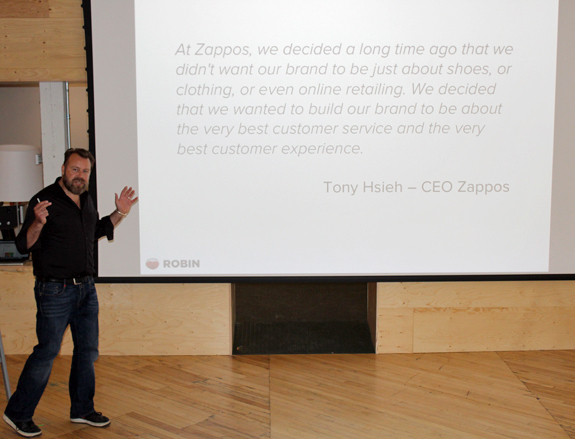 Shopify’s API is “just awesome,” says Michiel Gaasterland, content marketing for Robin. Or if they need to run a customer service operation, perhaps they’ll turn to Robin. The Dutch firm sees about half of its business come from the Shopify platform and serves more than 200 customers there. While it also integrates with BitCommerce, Magento, and a small Dutch platform, its focus is on Shopify at the moment, says Michiel Gaasterland, content marketing manager for Robin. 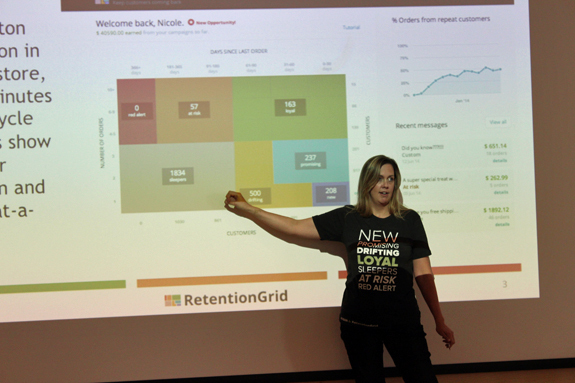 Robin and RetentionGrid are now integrating features from each other’s products to offer customers more value. For example a customer service rep looking at a profile on Robin could see where that person lands in terms of their loyalty on a RetentionGrid rubric. The two firms never would have connected if not for Shopify’s common platform. Both receive five-star average ratings from users after dozens of reviews. The app store is projected to see in the high seven-figures for revenue this year, Beckwith says. But for a platform scaling as quickly as Shopify, that’s still just a drop in the bucket. That in part is why Shopify charges a 20 per cent commission for revenue made through its app store, even though the industry standard (as determined by Apple with its App Store launch) is 30 per cent. It’s also a reason Shopify won’t hesitate to remove an app that’s not up to snuff. Beckwith says it will remove apps that are abandoned by developers, or aren’t meeting the standards of Shopify and its merchant customers.